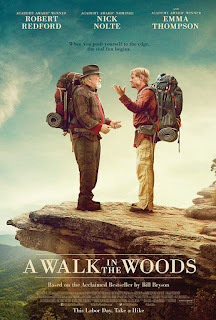 Well, the whole idea/concept of a hiking journey through the Appalachian Trail starring Robert Redford and Nick Nolte sounds extremely promising for anybody who shares a fondness for film and the outdoors. Even though it may not have achieved the high status one who expect of that combination, the good moments shine throughout thanks to gorgeous cinematography by John Bailey and strong performances by Redford and Nolte. The film’s plot revolves around two estranged friends who decide to hike the Appalachian Trail together, despite their age and physical abilities. Redford plays Bill Bryson, a successful writer who returns to America after spending 20 years in Britain, who finds himself adrift in his sudden realization of his old age and nostalgia for the days of traveling and exploring. After a walk in his backyard one day to a trailhead, Bryson decides to hike the entire length of the Appalachian Trail and contacts all his close friends in hopes they would join him. The only one to accept is Nick Nolte’s character Stephen Katz. Nolte shines in his performance as Katz by bringing his rugged and shaky voice and profane remarks to the table, but is able to showcase his drama acting chops in the more tender moments of the movie. The golden moments of the film proved to be the comedic ones thanks to near perfect chemistry between the two lead actors. So all-in-all, Director Ken Kwapis (The Office) manages to balance and combine drama and comedy into an amiable and light atmosphere punctuated by Nathan Larson’s peaceful and mellow soundtrack which helped to increase the sense of vast wilderness as the two trek along the mountains.